Artist Robert S. Neuman, born in Idaho, divided his time between Winchester and Mount Desert Island in Maine. Years ago, artist Robert S. Neuman’s parents took a train from their Idaho home to see a Newbury Street gallery exhibit of his paintings. At the show, someone asked his mother, “ ‘When did your son start doing art work?’ ” And she said, “ ‘Since he was old enough to pick up a pencil,’ ” Mr. Neuman said in a 1991 oral history interview for the Smithsonian Institution’s Archives of American Art. Raised in northern Idaho, where the high school essentially prepared students to enter the mining business, Mr. Neuman later recalled, he repeated the only art class there three times after his mother asked the superintendent to let him keep refining his talent. 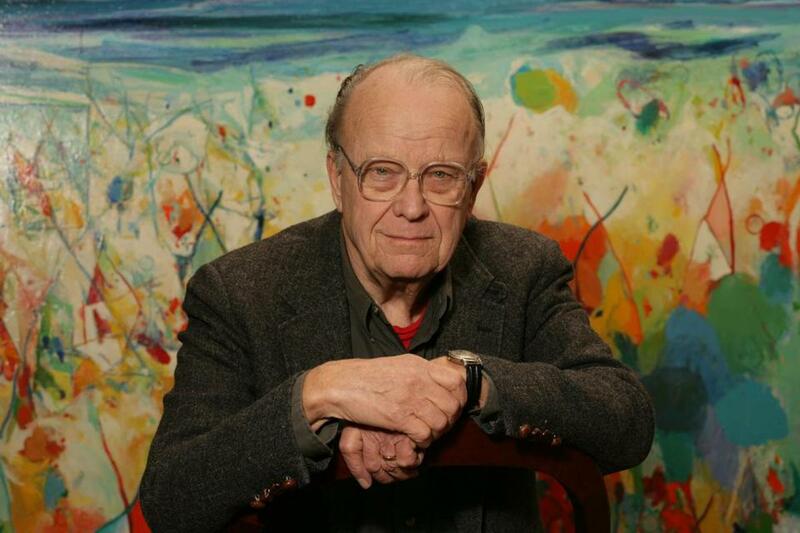 Mr. Neuman, an abstract expressionist whose work has been exhibited at the Fogg Art Museum at Harvard University and in New York City at the Metropolitan Museum of Art and the Whitney Museum of American Art, died June 20 at a rehabilitation and care center in Lexington. He was 88 and divided his time between Winchester and Mount Desert Island in Maine, where he kept a house that was as visually vibrant as his work. Painting and creating until the end of his life, Mr. Neuman exhibited his work at the Heckscher Museum of Art in Huntington, N.Y., in 2012. “Robert S. Neuman’s Ship to Paradise,” a series of etchings and lithographs, was a visual response to “The Ship of Fools,” an allegory that theologian Sebastian Brandt wrote in the 15th century. Robert Sterling Neuman was the only child of Oscar Neuman and the former Katherine Samuelson, a Swedish immigrant. He helped out in his father’s hardware store while growing up in Kellogg, Idaho, a town with neither galleries nor artists, where “every other door on the main street was a bar, there were brothels and so forth,” he said in the oral history. In high school, Mr. Neuman played basketball and was in the marching band. He initially attended the University of Idaho, leaving to serve in the Army and the Army Air Forces stateside at the end of World War II. Returning briefly afterward to the university, he left to attend the California College of Arts and Crafts, receiving a bachelor’s degree and a master’s in fine arts. He also married Patricia Feddersen, his girlfriend since the seventh grade, with whom he had two daughters. Their marriage ended in divorce. Mr. Neuman taught at the California College of Arts and Crafts and at a school in San Francisco. He also studied with German Expressionist Max Beckmann before receiving a Fulbright fellowship to live in Germany. Back in the United States, he taught at the State University of New York at New Paltz and began his first series, “The Black Paintings,” until a Guggenheim fellowship brought him to Barcelona. “I hadn’t painted with gray before because I thought it was a neutral color, but the atmosphere and the light were such that even grays seemed to contain a great deal of color,” Mr. Neuman said in the oral history about his time there, which inspired his “Barcelona Paintings” series. In 1972, Keene State College appointed Mr. Neuman chairman of its nascent art department. Except for two years that he took off to paint full time, he remained at Keene until retiring as professor emeritus in the early 1990s. While at Keene, he met Mary Susan Savage, known as Sunne, at her Sunne Savage Gallery in Boston. They married in 1979. During their honeymoon in Spain, he began his “Alhambra” series of paintings after visiting the historic palace that bears that name in Granada. An abstract expressionist who taught classes to ensure a steady income, Mr. Neuman honed his bartering expertise, trading his talents for anything from doctor’s appointments for his children to vehicles. Memorably, he swapped a painting for a house on Mount Desert Island. In addition to his wife, Sunne, his daughters Ingrid and Christina, and former wife, Patricia, who lives in Weymouth, Mr. Neuman leaves another daughter, Elizabeth, of Littleton, and four grandchildren. A memorial service for Mr. Neuman, whose ashes were scattered in the ocean off Mount Desert Island, will be held at 2 p.m. in the Parish of the Epiphany in Winchester on Sept. 9, which would have been his 89th birthday. Mr. Neuman, who preferred only the finest art tools, “had this predisposition for picking things up off the street,” Ingrid said. “He would incorporate these found things into his paintings and collages.” He might dip into paint the plastic tray from a Whitman’s Sampler of chocolates and use it to create patterns on his artwork. By example, he placed a premium on imagination.